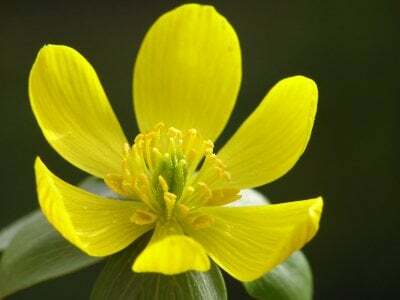 Winter Aconite (Eranthis) resembles a Crocus mixed with Buttercups. This flower grows in the later winter months. They are a small flower, reaches only about 3-4 inches tall, that covers the ground in the end of winter. The bright yellow color really brightens up the dark winter months. They are a bell shaped flower that’s petals open like a tulips would. I like to think of this flower as a small tulip! Along with the bright yellow flowers grow small dark green leaves. The leaves are almost as tall as the flowers, meaning not very tall at all! If you have planted this flower in your winter garden, you will see that it can grow in almost any soil type. As long as it has good drainage. Which let’s face it, a majority of flowers need well drained soil to grow. They do however like shade rather than sun. Plant your bulbs in August or September and they should be ready to grow by winters end. Bury the bulbs about 3 inches deep and space each bulb about 2 – 3 inches apart. This is a very low maintenance type of winter flower. The kind I especially like! Once you plant the bulbs, they wil grow. You don’t have to worry about dividing or cutting back this plant at all. They sow their own seeds and spread out as they grow. This is definitely one of the easiest flowers to grow outdoors in the winter.